The image, which Bibles show us is different from what the Holy Quran does. Bible’s narration is this way: “Mary and her fiancé, Joseph the Carpenter, went to Bethlehem in south of Palestine in order to participate in head count. In Bethlehem , because the place was so crowded, they could not find a place to stay and they were forced to pass the night in a sheepfold in which the animals and sheep were kept there. But the Holy Quran introduces his birthplace in an area toward the east. “Relate in the book (the story of) Mary, when she withdrew from her family to a place in the east “. There was nobody with Mary and the Quran’s narration about the birthplace and birth events of prophet Jesus, is completely respectful and protects the Prophet’s sanctity, whereas the distorted Bibles narrate these events in complete contradiction to the prophets’ divine personalities. 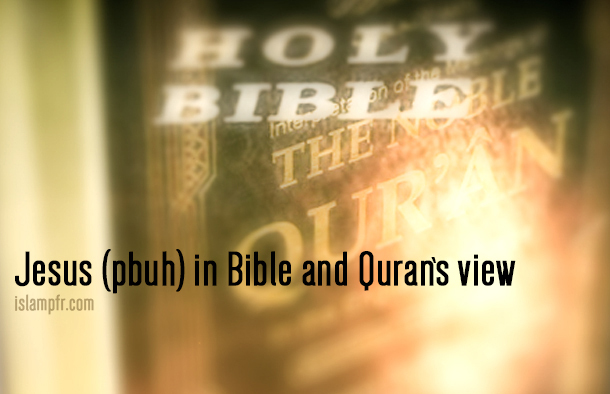 About the state of his birth, there are differences between the Quran and Bibles. Bibles state that: When Jesus Christ was born in that sheepfold, the angels called the shepherds of that region to let them know of the birth of a blessed baby. When the shepherds, and the Magi who had come from the east looking for the star, which had risen above the birthplace, and the people had all gathered there, they thought that Jesus Christ was the son of Mary and Joseph, so based on the Bibles’ reports, nobody knew that Jesus did not have a father. However, from Islam’s viewpoint, it is not the same. Islam does not mention Joseph the Carpenter and expresses that Mary was only present in the birthplace of Jesus, and when she got pregnant with Jesus by the announcement of Gabriel, she became very upset. But God comforted her by saying that this matter is divine providence. Everyone wondered at Jesus’s birth and maligned her (Mary), and Jesus started speaking in his cradle in order to reject this accusation. The talk of Jesus spread very quickly among Bani Israel (Children of Israel (Israelites)). In Matthew, the first subjects are about Jesus’ ancestry and in fact, it recites Joseph the Carpenter’s ancestors and considers Jesus as one of his offspring. But Mary has been introduced in Bibles as an ordinary lady and her only distinction is that she gave birth to a child who was named “God’s Son” later and after centuries. Christianity realized the fact that they need to raise Mary’s Position, thus it was until the previous century when the church announced that: “It has been inspired to us that Mary, just like Jesus, has gone to the Heavens.” These reflections are in contradiction to the Quran, because the Quran introduces an excellent face for Mary and considers her a prayerful lady with a lot of moral benevolences. The word “Christ” (Messiah in Hebrew) refers to Jesus’ political and social power and in Jewish culture, “Messiah” means a person who has been prepared to take the social power, and this term has also been used for Saul (Talut), David, and prophet Solomon (Suleiman) (PBUTA). Its literal meaning refers to a person who has been baptized with Oil of the Catechumens and the narration is as following: when they chose Saul as the governor for the Jews, prophet Samuel baptized him with Oil of Catechumens and after him, he did so with David and…, So baptizing with the Oil of Catechumens is for taking the power and Jesus Christ is called Christ because he proceeded to run a new government. Unfortunately, today’s distorted Christianity introduces Jesus as though he did not have anything to do with government and social activities and that he was an unsociable, sequestered person! Whereas Holy Jesus wanted to execute God’s orders just the same as the other prophets and the word “Christ” refers to the fact that he wanted to establish a government, and in fact he did start this combat, and his first struggles were with the votaries of the template of Solomon. The inner Jewish government was led by the chiefs of Bani Israel (Children of Israel (Israelites)), and prophet Jesus struggled with (those) votaries as to why they did not implement the divine laws properly. In the Holy Quran, we do not have much anecdotes about the days before his prophetic mission, and the most important matter that has been mentioned about this period is that he spoke in his cradle and called himself the Slave of God. We have nothing further and more explicit about his childhood, and we have received no clear and exact report from the Bibles either. In his descriptions, prayer and worship have been mentioned such that it is said (in the Quran): “And he hath made me blessed wheresoever I be, and hath enjoined on me prayer and charity as long as I live;”  It explicitly refers to prayer and charity and the fact that he has been from one of the prayerful and ascetic people and that he never put religion (divine laws) aside. The ambiguity, which Christianity suffers from, stems from the question as to why Christians do not follow divine laws, and they have to answer this question regarding the reason why Jesus (PBUH) did his religious activities but Christians do not follow him. Based on the Holy Quran’s view, he had come with divine laws, had followed those laws, and had even invited others to follow those divine laws; and that he was also a benefactor. “(He) hath made me kind to my mother, and not overbearing or miserable”  This is contrary to the aggressive personality, which the Gospel of John presents of him towards his mother. In the Gospel of John, in the wine narration (Run Out of Wine), when his mother tells him that they do not have wine, Jesus answers: “Woman, why do you involve me? My time has not yet come.”  he has an aggressive mode, which is opposite to the Holy Quran that considers him a benefactor toward his mother, and his personality is defined as that of a blessed person: “He hath made me blessed”  and he is defined as a righteous person “And Zakariya and John, and Jesus and Elias: all in the ranks of the righteous”  and all these show the excellent face that Islam introduces of Jesus, and the Bibles try to lower Jesus from his elevated rank. The Holy Quran emphasizes on two points; one is that Jesus Christ confirmed Torah: “Confirmation of the law that had come before him”, and this matter has also been mentioned in Bibles too that “I have not come to reject Torah, but to complete it”. Jesus Christ (PBUH) had his own religion and completed Moses’ religion, and this verse proceeds by mentioning his role of annunciation، where he annunciated prophet Muhammad’s (PBUH) prophetic mission: “And giving glad tidings of a messenger to come after me, whose name shall be Ahmad ” . Bibles do not talk about the second point except for the Gospel of Barnabas, which mentions the annunciation, and that is generally accepted by Christians. About Jesus’ destiny, all the Bibles almost have the same reports, which is as follows: The heads of Solomon’s temple gathered and caballed against Jesus and arrested him and handed him to the Roman king. The Roman king initially did not want to execute Jesus but due to enforced pressure by the Jews, he took Jesus to the place of criminals’ execution and crucified him along with two other persons. Prophet Jesus deceased and they put him in a grave but after some time they saw that he was not in that grave. He had rose from the dead and had gone to the Heavens, but the Holy Quran does not accept this  and asserts that Jesus Christ is alive, and that they had not crucified him. The person who revealed the place of prophet Jesus, by God’s will, and because of the forfeiture of his sin, appeared like prophet Jesus (PBUH), and the Jews wrongly crucified him instead of prophet Jesus (PBUH). It has been mentioned in Islamic texts that Jesus Christ will come back accompanying Imam Mahdi (AJ), and that they will establish a divine government on earth. The twelve Apostles were continuing Jesus’ movement and they have been referred to in the “Acts of the Apostles” of the Four Gospels. The Holy Quran introduces the Twelve Apostles as chaste, God-fearing, and amiable people  and demonstrates an honorable character of them. Also, Jesus’ successor was one of them. But it is not the same in the Bibles, rather they introduce unpleasant and dishonorable faces of them, where they are described as ignorant, infirm, and heathen people who were not very influential in the society , in contrary to the view of Islam that considers them as believers and virtuous men. The Four Bibles introduce a Jesus, which is not complete but regardless (of these matters), the face which the Bibles describe is different from that of which Christians consider. Holy Christ had come to implement the religion and divine rules and he had not come to rescue himself and a few people only. He was very industrious and had self-devotion. In verses 49 to 53 in chapter 12 of Luke, it is mentioned that “I have come to light a fire on the earth, so all I wanted has been done already”. So it shows that Jesus Christ has come to combat and he even invites his companions to prepare swords and armaments so that they can fight, and the one who does not have a sword should sell his garment and buy one” (Luke, second chapter, verse 7). The claim that some make about Jesus not having anything to do with politics is not true; in contrary, he directly attacked the king. Christians say that he was secularist but this is not so at all. Jesus was a political, combatant, and strong person, and his politics and faith were directly related and not separate entities. “Behold! The angels said: “O Mary! Allah hath chosen thee and purified thee- chosen thee above the women of all nations (42)”. “On the third day a wedding took place at Cana in Galilee. Jesus’ mother was there, 2 and Jesus and his disciples had also been invited to the wedding. 3 When the wine was gone, Jesus’ mother said to him, “They have no more wine.” “Woman,[a] why do you involve me?” Jesus replied. “My hour has not yet come.” His mother said to the servants, “Do whatever he tells you.” Nearby stood six stone water jars, the kind used by the Jews for ceremonial washing, each holding from twenty to thirty gallons. Jesus said to the servants, “Fill the jars with water”; so they filled them to the brim. Then he told them, “Now draw some out and take it to the master of the banquet.” They did so, and the master of the banquet tasted the water that had been turned into wine. He did not realize where it had come from, though the servants who had drawn the water knew. Then he called the bridegroom aside and said, “Everyone brings out the choice wine first and then the cheaper wine after the guests have had too much to drink; but you have saved the best till now.” What Jesus did here in Cana of Galilee was the first of the signs through which he revealed his glory; and his disciples believed in him. Since Christians believe that the Holy Spirit continuously guides the church, they say that understanding the secret of Trinity will continue its growth and progress with the help of popes, councils, philosophers, and mystics. The first church councils announced that God is unique, but He has 3 hypostases. The word “hypostases” has a Greek origin and is defined as the path of existence (essence). Based in this principle, the three hypostases are three paths or ways of God’s existence or action. Arab Christian writers have used the Greek-originated term “hypostases” and the word “Icon” (meaning symbol) for the better explaining of the concept of Trinity. The Latin equivalent of the word “hypostases” is mask (cover). In a session, which Mamoon had prepared for scholars of different religions, and where Imam Ridha was the representative of Muslims, a debate started between Imam Ridha and a Christian scholar about divinity or slavery of Jesus Christ (PBUH). The Christian scholar considered a divine and supernatural characteristic for Jesus. Imam Ridha said: “Jesus was a great man in all aspects except one matter and that was the fact that despite other prophets, he did not have any desire for worship!” The Christian scholar answered:” It is strange that such a statement is made by someone like you, He was more prayerful than any other person”. As soon as Imam Ridha heard the Christian scholar’s claim he said:” Whom did Jesus worship?” Is not worship a sign of slavery? Is not that a sign of not being God?